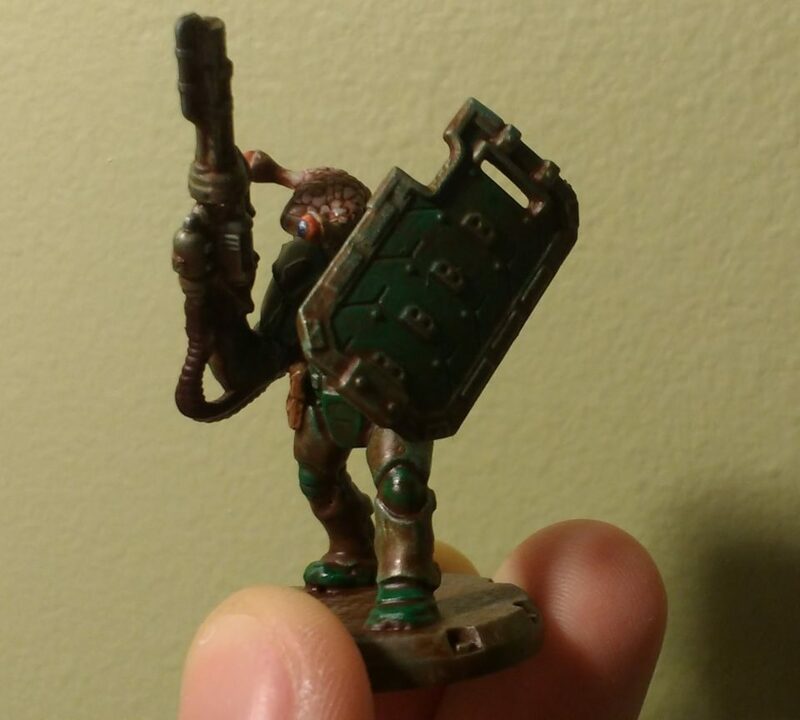 This is the first miniature that I’ve finished since January. I started work on several but, in general, I’ve been distracted. First by Fire Emblem, then The Legend of Zelda: Breath of the Wild, then Sentinels of the Multiverse, and finally in wrapping up my Broken Covenant Pathfinder campaign. So back in November, I picked up two packs of the Corp Officers Heavy Rangers Squad for $4 from Asmodee’s 2016 Black Friday Sale. The alien head is from Hasslefree miniatures. I was cautious with the first pack, only switching out the heads, but variety is the spice of life so I was more ambitious this time around.For my second take on this miniature I decided to change the pose and equipment. The arms, shield, and weapon are stolen from an Enforcer Peacekeeper set I picked up.